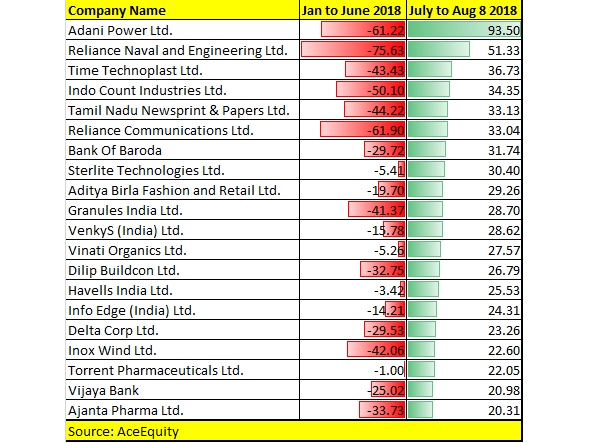 We have collated a list of 20 stocks which rose 20-100% from July till August 9 after falling up to 70 percent in the first six months of 2018. Equities are back with a bang. However, the bigger story is small- and midcaps that fell up to 70 percent in the first six months of 2018 have bounced back starting July. This has come as a breath of fresh air for investors. Benchmark indices have been hitting fresh highs since July. The Sensex crossed the 38,000 mark and the Nifty is hovering around 11,500 levels. Although largecaps are leading the rally in benchmark indices, data suggests that most beaten down mid- and smallcap stocks in the first six months of 2018 recorded double-digit returns in a matter of days. Mid- and smallcap stocks witnessed pressure on higher valuations, implementation of the Additional Surveillance Measure (ASM) framework, failure of a pick up in earnings growth and resignation of auditors. “The current market scenario may be read as a reversion to mean in the valuation premium of midcap vis-a-vis the Nifty. Over the last 2 years, the valuation premium had gone way above the long term average, which triggered a de-rating in of mid- and smallcap stocks,” Vineeta Sharma, Head of Research at Narnolia Financial Advisors, said. “As the Nifty started hitting new highs, suggesting that the structural bull market remains intact. The negative price performance in mid- and smallcaps have provided space for a comeback in these beaten down stocks. One should not get carried away with price performance. Valuation of the entire mid- and smallcap space is still much higher than largecaps,” said Sharma. We have collated a list of 20 stocks that rose 20-100 percent from July till August 9 after falling up to 70 percent in the first six months of 2018. Adani Power, which fell 61 percent in the first six months of 2018 rose 93 percent since July, data from AceEquity showed. Reliance Naval and Engineering fell 75 percent in the January-June period but gained 51 percent since July. Reliance Communications, which saw a cut of 60 percent in first six months of 2018, recouped losses and rose 33 percent since July. Other stocks which corrected and recouped losses in the BSE 500 index include Indo Count Industries, Bank of Baroda, Sterlite Technologies, Vinati Organics, Delta Corp, Havells India, Inox Wind, Granules India, Venky’s India, Aditya Birla Fashion, Dilip Buildcon, Torrent Pharma, Vijaya Bank, and Ajanta Pharma. In the BSE Smallcap index, over 200 stocks delivered double-digit return since July. Some smallcap stocks that saw a cut of up to 80 percent in the first six months rose up to 70 percent since July. Arrow Greentech which corrected 70 percent in the first six months of 2018 witnessed a sharp bounceback since July. Other beaten down stock that sprung back include: Monnet Ispat, Borosil Glass, Indosolar, Ok Play India, Gati, Deep Industries, JK Paper, Time Technoplast and Everest Industries. Is it the right time to get into beaten down mid- and smallcaps? We have seen a valuation erosion in mid- and smallcaps, but earnings growth is showing signs of improvement. Valuations too have fallen which makes them a lucrative buy. “From an investment perspective, some quality small-and midcaps are available at cheap valuations. The beating they took in the last 4-5 months and 40-50 percent correction provides ample space for a retail investor to start accumulating value stocks,” Mustafa Nadeem, CEO, Epic Research, said. 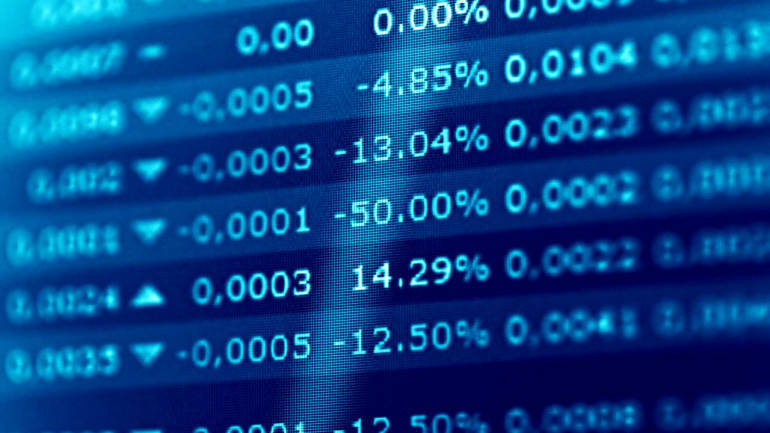 Data suggests that midcaps have corrected about 12 percent from the top while smallcaps have corrected about 22 percent. Although mid- and smallcaps have corrected significantly from the top, they are still trading at significant premium to their largecap peers. “This is just a pullback and investors who are stuck at higher prices should look to exit. Investor should adopt a stock-specific approach and look to accumulate quality names like Ashok Leyland, Dewan Housing Finance and Tata Metaliks on every dip. These stocks can offer superior return in the medium to long term,” Atish Matlawala, Senior Analyst, SSJ Finance & Securities, said. Investors should use rallies to exit stocks that are not showing earnings momentum while accumulate stocks which are showing a growth potential. Among 700 companies that have declared their quarterly figures, median sales and profit growth of largecaps is 16.3 percent and 24 percent, respectively. Sales growth in mid and smallcaps stands at 15.6 percent and 13.3 percent, respectively. “Earnings data of some 700 companies suggests better return on equity improvements in largecaps compared to mid and smallcap companies in general. The valuation ratio of midcaps to Nifty has historically been around 1.5. After 2017, this ratio has moved towards 2 (it briefly touched 2.4 in July),” Sharma said. “This suggests a little caution on the valuations of midcaps. One should have a highly selective approach in picking midcaps. So, staying with largecap names with stable growth is advisable,” Sharma stated.